We are pleased to celebrate the success of all former pupils of Ernest Bevin College (alumni) and are proud of all their achievements. Special congratulations to the Mayor of London, Sadiq Khan, who was a Blue Tie and has been a good friend to the college over many years. 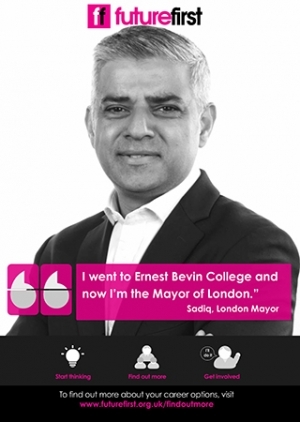 In 2014 we began a big push to encourage former students of Ernest Bevin College (and its predecessor schools) to join our Alumni community. An organisation called Future First helps state schools like Ernest Bevin to get the most from our alumni network. We send out about 10 emails a year, with information about events, school newsletters etc. We have set up a regular programme of talks on a Wednesday afternoon where we ask former students to talk to current Sixth Formers about life after Bevin. Here’s some of our former students who are helping inspire the current pupils by coming into college to talk to Sixth Formers about life after Bevin.